This is just a random one I'm throwing out there today. Should you be feeling a bit blue or going through a mid-week slump, this video is sure to put a smile on your face. Although, chances are you've already seen it as it's one of the most popular videos in circulation at the moment. 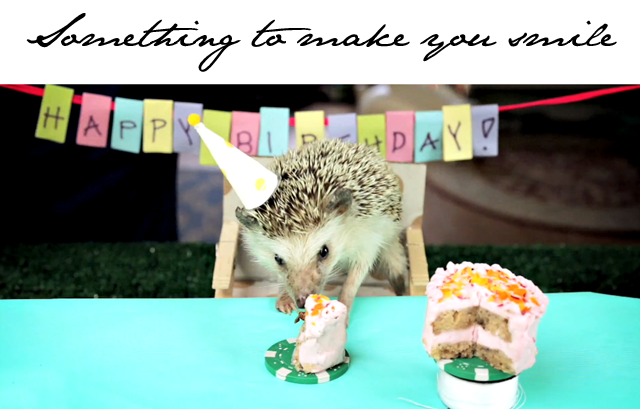 Basically, it's a Hedgehog celebrating his birthday. Everything's miniature and adorable. Even if you've seen it ten times, you'll find yourself coming back for more. Happy Hump Day, everyone. Ok, and just in case that isn't enough cuteness for you, how about a hamster eating a tiny pizza? Now, if we could only get the animals to do a tiny runway show?! Don't ever say we don't deliver cutting edge news here at Fashion Foie Gras. Ha!